The Writing Vein: NaNoWriMo Day 21 update - I'm a Winner! I haven't been keeping up with my daily posts about NaNoWriMo this year. I was a little derailed by the election and then other things keeping me busy. But I have been writing every day. And - tada - I'm happy to announce that I have been officially verified a NaNoWriMo Winner! I uploaded my story, word count checked, and I am at 52,252. That is a happy number. In years past, when I passed the benchmark early, I usually stopped shortly after. Because (a) the story was done, or (b) there wasn't much more to write before The End so I did and stopped, or (c) I didn't like what I was writing and vowed to never touch it again (two of the years writings will not be revisited - yuck). 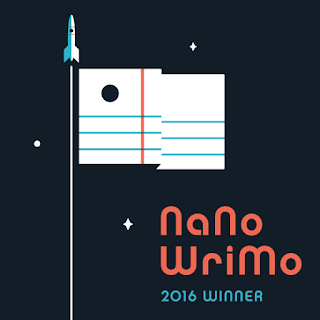 So this year, my ninth consecutive year as a NaNoWriMo winner, I have decided that I am going to keep writing. Because I have more to write about for this project and I don't hate it, yet. Therefore I am announcing that I am setting myself a new goal of 60,000 words before November 30th. I was going to just say, I'll keep writing every day, but I know me. And knowing me means that having a more concrete target is a little more motivating. And telling a few other people keeps it real and keeps me accountable, even though I doubt anyone would really do much if I don't make it.